Blood Reef is a supplement for DeepWars, a tabletop wargame where forces battle below the waves of a lost underground ocean beneath a frozen southern continent. 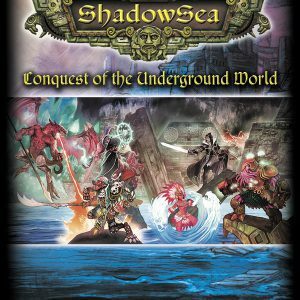 Players command warbands of different troops and special personality characters to search for treasure, explore sunken ruins and recover ancient artifacts. 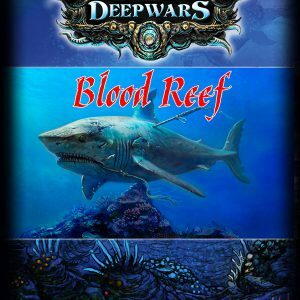 This book details the region of the Shadow Sea where Blood Reef is located, describing the new environments, wild sea creatures and scenery that can be found there. 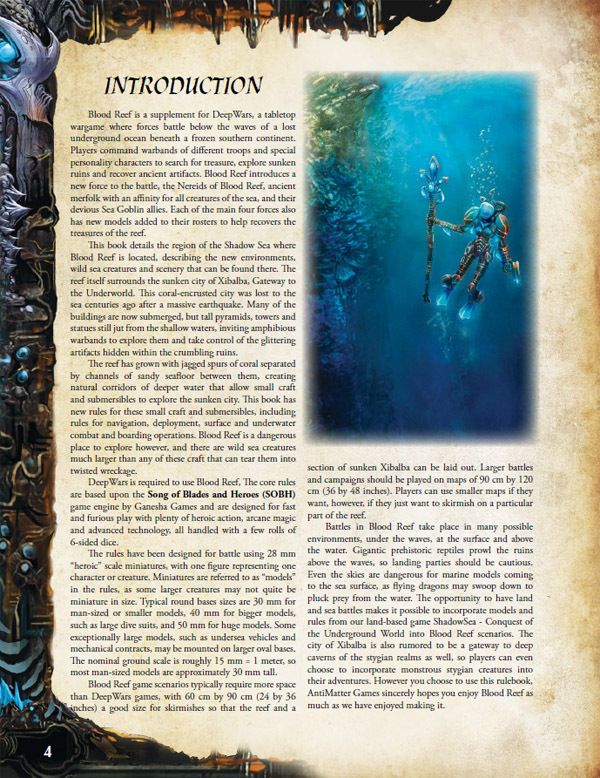 The reef itself surrounds the sunken city of Xibalba, Gateway to the Underworld. 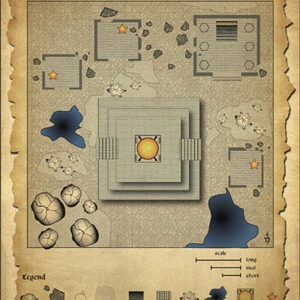 This coral-encrusted city was lost to the sea centuries ago after a massive earthquake. 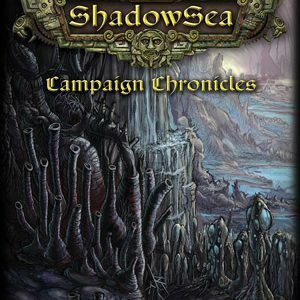 Many of the buildings are now submerged, but tall pyramids, towers and statues still jut from the shallow waters, inviting amphibious warbands to explore them and take control of the glittering artifacts hidden within the crumbling ruins. 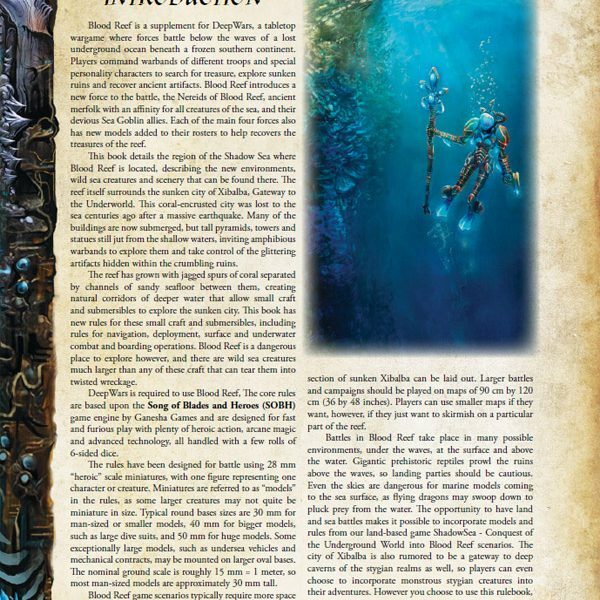 – NEW FORCE: The Nereids of Blood Reef have joined the battle, protecting their reef home. 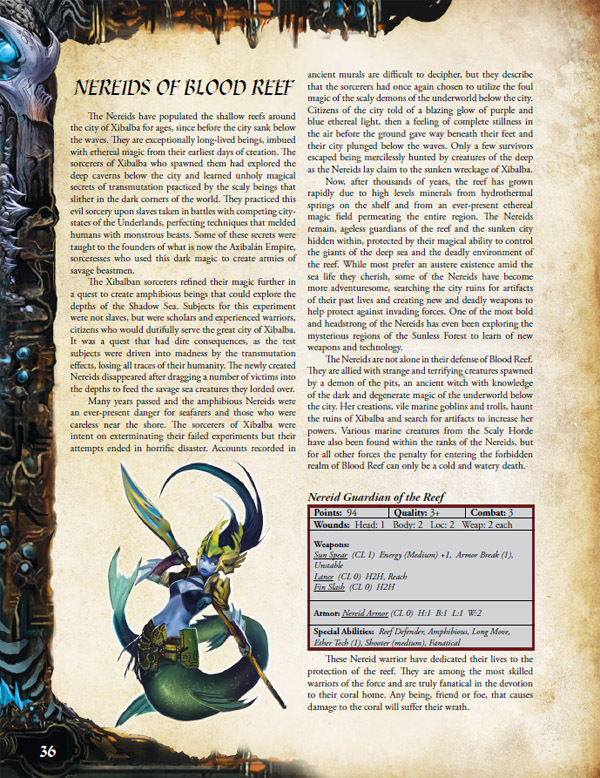 The Nereids are a unique force of merfolk, allied with a foul Sea Witch and her Sea Goblin and Sea Troll minions. 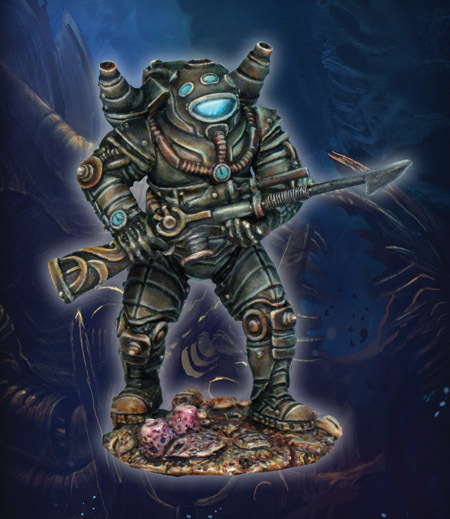 The Nereid force relies on speed and maneuverability to control the battlefield and wield crude but powerful energy weapons utilizing the bountiful ether crystals found in their realm. 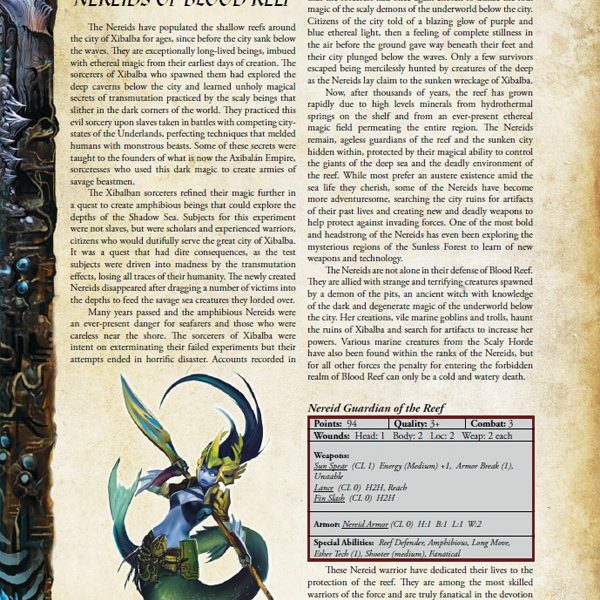 Nereids also control many large and deadly sea creatures with their See Enchantment magic spells. 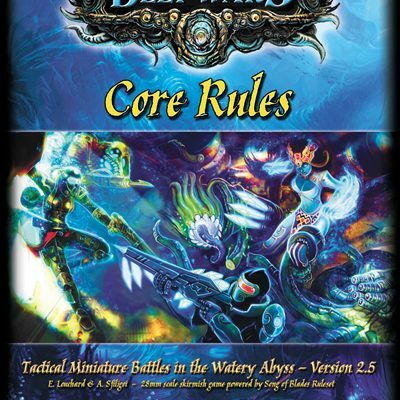 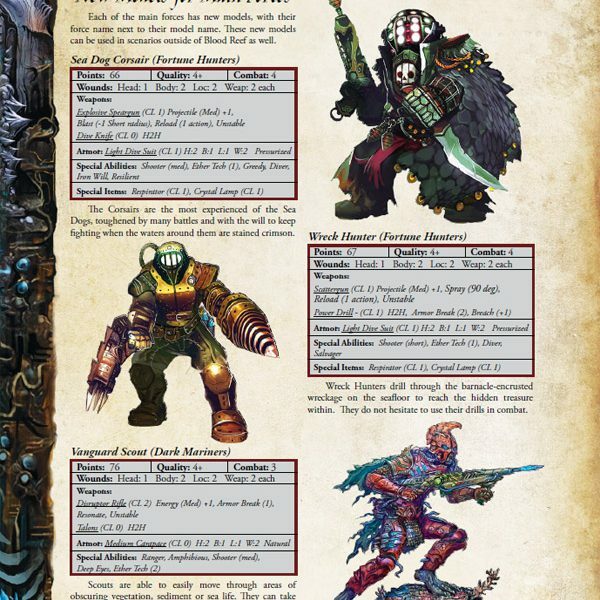 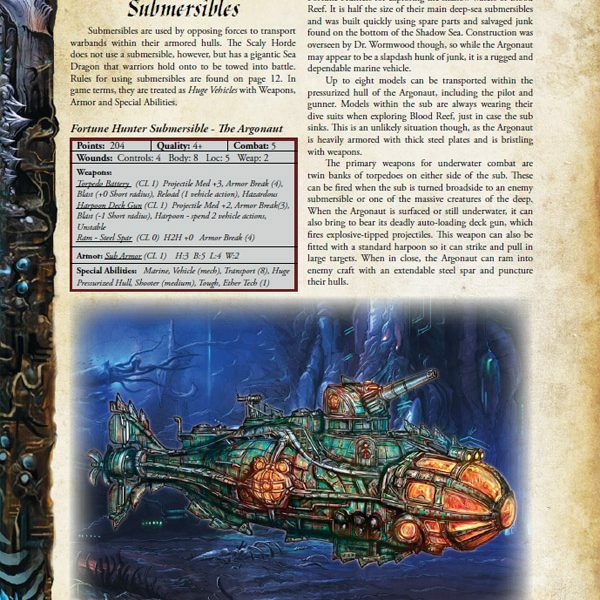 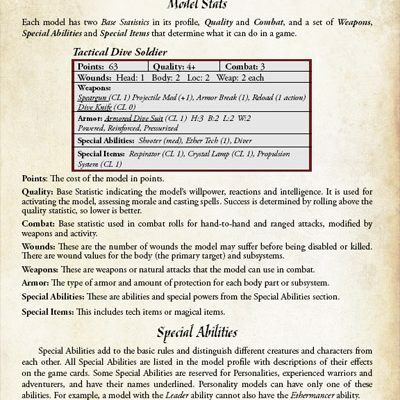 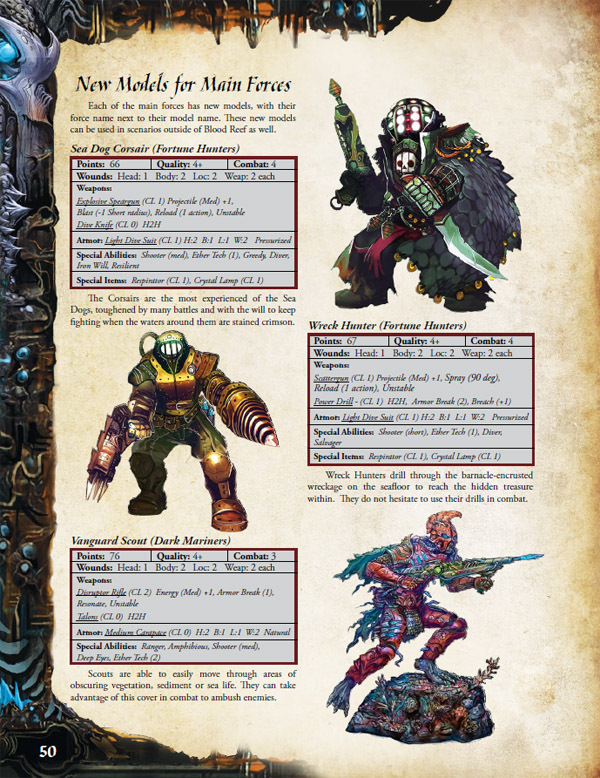 – NEW VEHICLE RULES: Blood Reef introduces new rules for vehicles, and includes rules for small submersible troops transports for the Fortune Hunters, Dark Mariners and Ancients of Atalan. 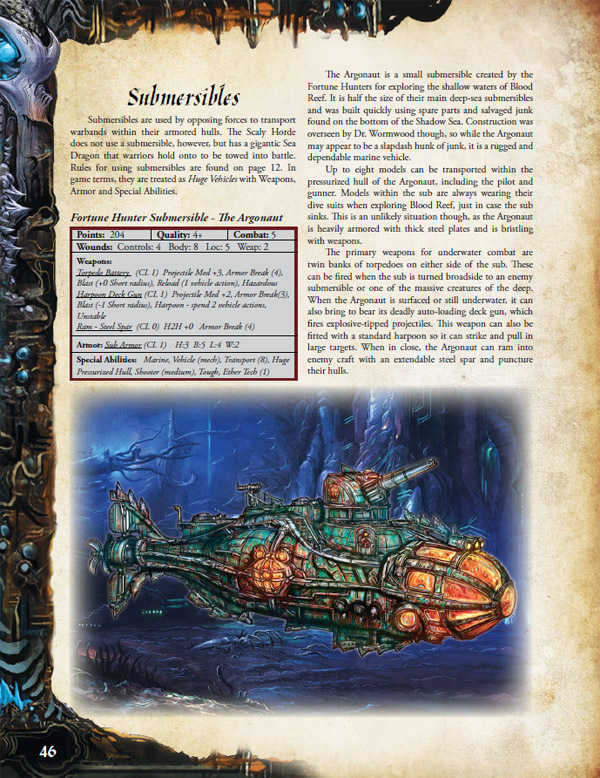 The Scaly Horde is not left out, as they are towed into battle on the back of a massive sea dragon. 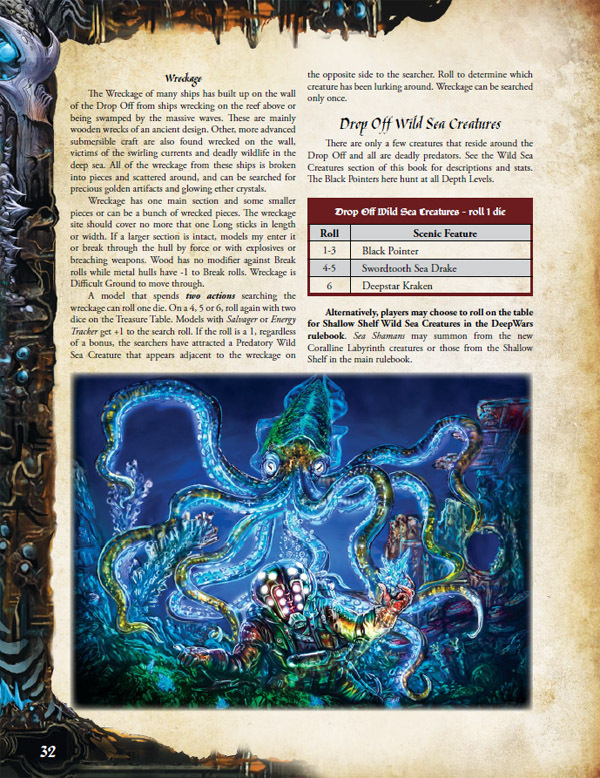 – NEW MAGIC SPELLS: Create shark torpedoes or create walls of stinging jellyfish with the Sea Enchantment spell list, or curse enemies or turn them into wriggling worms with the Witchcraft spell list. 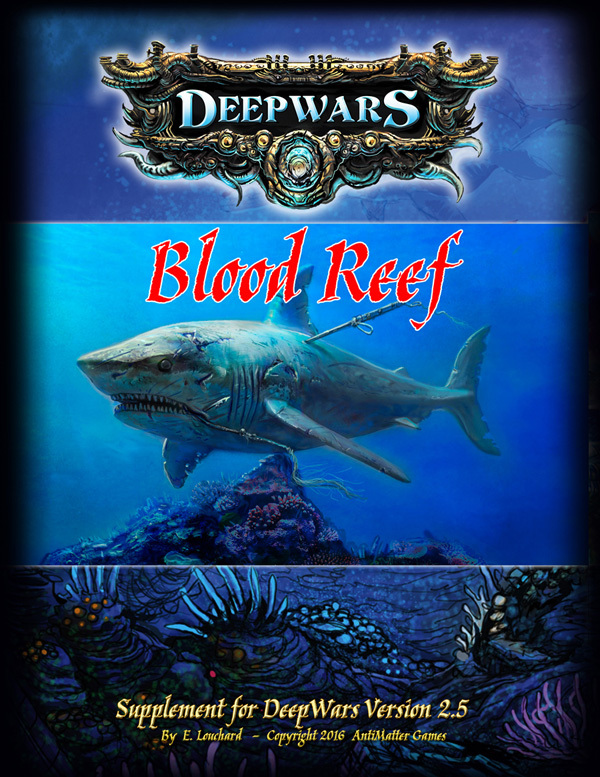 – NEW ENVIRONMENTS: Battles in blood reef take place within the twisting sand channels among coral walls in the Coralline Labyrinth, or at the edge of the reef, the deadly zone of strong currents and massive sharks known as the Drop Off. 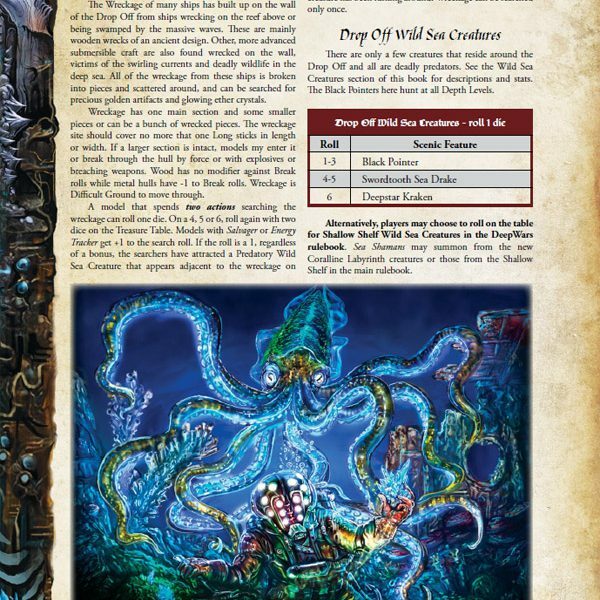 The main battle zone though, is the loss sunken city of Xibalba. 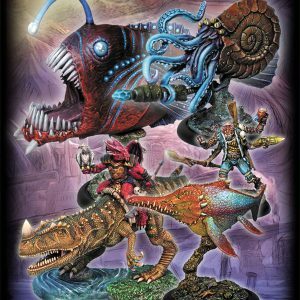 Gigantic prehistoric reptiles prowl the ruins above the waves, so landing parties should be cautious. 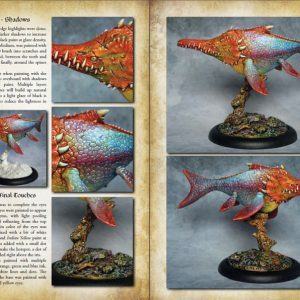 Even the skies are dangerous for marine models coming to the sea surface, as flying dragons may swoop down to pluck prey from the water. 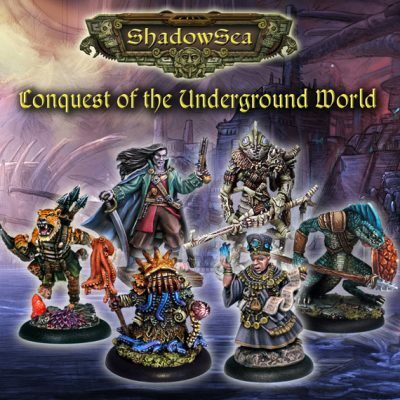 The opportunity to have land and sea battles makes it possible to incorporate models and rules from our land-based game ShadowSea – Conquest of the Underground World into Blood Reef scenarios.